Be a good friend and SHARE this post! If you’re life has turned into one perpetual state of exhaustion, I’ve got something really important to share with you — it’s not normal to be that tired. Regardless of how you got there, it’s possible that you’ve blown off many key, but not well known adrenal fatigue symptoms that could help you get your energy back. Maybe you’ve been tired for a long time… wait, the word “tired” doesn’t even begin to describe the level of fatigue you feel through your entire body. If you’ve struggled to get out of bed, no amount of sleep seems to help (and sometimes you feel even more tired in the morning), you can’t focus and feel like you can’t remember what you’re supposed to be doing… then yes, we’re on the same page. I know how you feel because I’ve experienced it before, however I was lucky enough to know that being tired wasn’t just about getting more zzzz’s. Today’s guest is going to share with you some really great information about adrenal fatigue symptoms that many don’t realize constitutes a graver problem with their health than just feeling tired. AND — if you’re interested, we’re hosting a webinar on this topic in the next couple of weeks that’s invite-only. CLICK HERE to snag an invite so that you can get first crack at one of the few spots we have available for it! CLICK HERE to listen and subscribe through iTunes!!! Then take a moment and leave a review on iTunes sharing what you’ve learned and why others would benefit from subscribing as well! Jennifer Fugo: Welcome back to the Gluten Free School Podcast. I’m your host, Jennifer Fugo. Today, we are going to talk about your adrenals. Well, yes your adrenals, but we’re going to talk about a condition that you probably heard, which is written about often times on the internet and coined adrenal fatigue. I know personally all about this issue because I had adrenal fatigue back in 2009. I thought that bringing this special guest on today in order to talk about this topic would be a really great opportunity for you to understand exactly what adrenal fatigue is and to get a sense of what may be contributing to decrease an adrenal function or just basically, not feeling energized throughout your day. Well, we’re going to dive into a whole bunch of different topics on this. Dr. Jill Carnahan is my guest and she has a lot of experience in helping people all over the country feel better using functional medicine. Dr. Jill Carnahan is a functional medicine doctor, duly board certified in family medicine and integrative holistic medicine. She received her medical degree from Loyola University Stritch School of Medicine in Chicago and her Bachelor of Science Degree in Bioengineering at the University of Illinois in Champaign-Urbana. She was one of the first 100 healthcare practitioners to be certified in functional medicine through the Institute for Functional Medicine. In 2010, she founded Flatiron Functional Medicine in Boulder, Colorado, where she practices functional medicine with medical partner, Dr. Robert Rountree. Dr. Carnahan is also a 13-year survivor of breast cancer and Crohn’s disease and passionate about teaching patients how to live well and thrive in the midst of complex and chronic illness. She is a prolific writer, speaker and loves to infuse others with her passion for health and healing. Welcome to the podcast, Dr. Jill! Dr. Jill Carnahan: Thank you, Jennifer! I am so glad to be here with you. Jennifer: I mentioned you are very involved in functional medicine. And for those out there who might not understand what that is, could you give us a little bit of a recap? Dr. Jill: Absolutely! I love functional medicine. I’m passionate about teaching others about it. I’m conventionally trained, as you mentioned. We know the allopathic model is wonderful in terms of acute infection and trauma injury. If you have a heart attack, you want to be at the best hospital so you can get immediate intervention. And so we have some strengths with our typical American healthcare system, but unfortunately, we have a lot of weaknesses. And we see these weaknesses when people get chronic diseases like diabetes, heart disease, obesity, all of these things that are happening to our society in greater and greater numbers. And what happens is drugs don’t cure those conditions. They may help symptoms for a short term, but they’re just Band-Aids. And what we do with functional medicine is we look at root cause. So if we have someone come in with, say, fatigue, which could be many, many, many types of things that cause that, as a functional medicine doctor, we want to look at the root cause and look underneath—I would say, it’s like looking under the hood of the car or I always tell patients, “I’m your personal health detective.” So I’m going to play detective and look for the underlying root cause of illness. And the cool thing about functional medicine is I was given this toolkit when I graduated from medical school with medications and referrals for surgery and things like that. Great tools! But now, with functional medicine, I’ve got a much larger toolbox. And instead of just surgery and drugs, I’ve got nutritional supplements, I’ve got diet, I’ve got exercise, I’ve got lifestyle modifications. And these are the types of things that really, really change the spectrum and the trajectory of health and disease. I always tell people you’re either walking towards disease or away from it. And we want you walking away from it. And with the tools of functional medicine, by finding root cause, you can actually reverse disease and things that were considered irreversible like autoimmune disease or other things can be actually reversed with functional medicine. Jennifer: I mentioned adrenal fatigue. And one of the things that’s really interesting that I came to learn is that conventional medicine doesn’t really acknowledge adrenal fatigue. And as I’ve shared with you before we started, I had written a paper about adrenal fatigue for one of my graduate classes. It was quite difficult to figure out exactly what it is. Now, I have gone through it personally and I’m more than happy to share some of those details as we go through this conversation. But why don’t we start off with the very basic what are the adrenal glands and what do they do? I think often times, we don’t fully understand the physiology that we’re talking about. It’s amazing how many people have never heard of their adrenal glands. Dr. Jill: Absolutely. So if you make a fist, your adrenals are about half the size of your fist. They’re little triangles that sit on top of your kidneys. So your flank, if you pat your flank right above your waistline and your back, they’re sitting right there on top of your kidneys. That’s where they’re located. It’s interesting because there are some people with adrenal fatigue that actually have because of that inflammation and issues with the adrenals will have low back pain right where they’re located. These glands just sit on top of the kidneys and they play a really profound role. If I have to sum it up in one sentence, they respond to stress. So they are a stress response organ and without them, we would be dead. I mean, literally, they’re life-giving, life-saving and you can have dysfunction with either overproduction of hormones or underproduction of hormones, which is what we’re going to be talking about today. They have a role in secreting more than 50 hormones that are necessary for life including—we’ve all heard of adrenaline. That’s from the adrenals. Cortisol, DHEA, progesterone and testosterone, and of course, there are other sources for some of these hormones like women’s ovaries produce some of the progesterone and men’s testes produce testosterone. But in certain periods of life, the adrenals pick up and produce all of these hormones as well. It’s absolutely an essential gland for life. It produces many, many important hormones. And if I have to boil it down to a few of the basic functions, again, I said stress response, and that’s usually in the form of the hormone called cortisol, which most of you probably have heard of, and energy production. So they help with the production of adrenaline, which makes our energy, kind of our fight and flight response. And one of the last things that is so frustrating for many people whether it’s overproducing hormones or under is fat storage. So this cortisol is actually helping us feast or famine and to store some of the fat for a time when we may not be able to eat as much when we’re under stress. It has a lot to do with weight gain, especially central weight gain and weight gain around—the fat around the organs, which we call visceral fat. And this is actually one of the most dangerous types of fats. That’s just a very, very brief overview of what it does. But that gives us an idea of how important this gland is and how much we really need it to function well. Jennifer: And just to also clarify for everyone, they are a part of the endocrine system or your hormonal system. So they’re pretty important in playing a role in this entire little symphony that’s happening of hormones in your body. Dr. Jill: Yes, and actually, I’m so glad you mentioned that, Jennifer, because I have people even come in and say, “I think I have adrenal fatigue” and I say, “You’re probably right.” But I never want to isolate that organ because always, the thyroid plays a role, the female or male hormones play a role, the brain, the pituitary play a role. And so there are so many factors in here that you can never just isolate that one part and not address the rest of the system as well. Jennifer: Well, here’s the big question. So we’ll get back to my point that I was initially making about what exactly is adrenal fatigue. So there’s a concept known as adrenal insufficiency, and there’s, you may have heard of, Addison’s disease, Cushing’s disease. Those are different types of issues that affect the adrenals. Why don’t you talk to us a little bit about some of these different problems that happen with the adrenals and then what exactly is adrenal fatigue. I know you have your own opinions on that, so please share what you can with us. Dr. Jill: Okay, so picture this spectrum in front of your eyes. And on the far right-hand side, we might have Cushing’s disease at the very, very, very end of that side. And on the far left of that line, you’re going to have Addison’s disease. Addison’s disease is complete and total failure of the adrenal gland to produce any of these necessary hormones for life. Someone with Addison’s disease without medication to replace those hormones would actually potentially be fatal. So they could die from this. A very common, famous example of this was our President JFK. He had Addison’s disease and one of the things you’ll see with that is the darkening in the skin tone because of changes in melatonin. And because of that, he had to have always replacement hormones. That’s the far left end, again, complete and total failure. The far right end is Cushing’s disease, which is excess production of the hormones especially cortisol that the adrenal produces. And on this side, you’re going to have someone with a weight gain in very strange places. Of course, the tie around the center, but also like humps on the shoulders, you can have a moon facies, you can have this insulin resistance pitcher, lots of things that go with excess cortisol. And what often happens to patients who suspect they have adrenal dysfunction is—I even had patients say, “Refer me to an endocrinologist.” They go to an endocrinologist and the endocrinologist basically laughs at them and says, “You don’t have Addison’s disease.” Because in conventional medical school, that’s what we’re taught, it’s the only manifestation of adrenal dysfunction. And what I wanted to clarify, you mentioned about my opinion on adrenal fatigue, this is definitely a dysfunction of adrenals, but I think there are so many varieties of dysfunction of the adrenals and so many different ways where people can present on that line that adrenal fatigue doesn’t really do it complete justice when we use that term. And the difficulty is, in conventional circles, you mentioned adrenal fatigue to a primary doctor who has no concept and they just look at you like you’re crazy. I just want to caution our patients. Yes, you may have symptoms and we have this title called adrenal fatigue, but be very cautious about how you use that word because in conventional medicine, you’re going to be not really acknowledged that that’s existing even though it’s a very true problem. And then people can have variations all the way along that line, either excess cortisol. And what happens is we have this diurnal rhythm in the day where you should have cortisol higher in the morning and then it goes down at night, so you can sleep. This curve is actually the most critical thing for vitality and health. They did some studies comparing that curve, how healthy is your adrenal curve, how high and normal is your cortisol in the morning, how low for sleep at night. And when people have dysfunctional adrenal curves, it was a bigger risk for mortality or death than smoking, which we know is a huge, huge problem. This is absolutely huge. And like I said, if you picture that line, adrenal fatigue is just one little spot on that line, but people can have dysfunction all the way along that line. And most people that I see at least don’t have Cushing’s and they don’t have Addison’s but they can have very, very significant life-altering adrenal dysfunction, which is what I like to call it. Jennifer: Let’s talk a little bit about who is susceptible because I ended up with adrenal fatigue. I’m not going to blame gluten entirely. I definitely feel that it was the food sensitivities that I had for many years that probably contributed to a state of dysfunction. I had lived in New York City during 9/11. That was obviously very stressful. I had a lot of issues functioning afterwards, being emotionally upset and having psychological things that I had to work through around that. I’m type A personality, going, going, so I definitely contributed to it on my own. And I’m sure the gluten didn’t help and the eggs and the dairy and whatnot. But who is more susceptible to ending up with what we call adrenal fatigue? Men? Women? And what if you have food sensitivities? Is that almost like a warning sign that you should be a little more careful with your energy and your adrenals? Dr. Jill: So this is great because we think about stress often as just what you experienced after 9/11, the psychological and the work pressures, say you’re dealing with a difficult marriage or a child who is ill or so many things in our life. And our bodies are meant to respond in these spikes to stressors. So a stress goes up, we deal with it. Like the old sabretooth tiger analogy, which has been quoted many, many times, we respond to that danger and we run, and then it’s done. And our adrenals go back to normal. But nowadays, what happens is people have, again, a difficult work situation, a long-term stressor, maybe they’re writing their book or they’re dealing with a sick child or their own health issues. And so these stressors basically start. And you think about a line goes up and stays high for a long time. Our adrenals are not meant to handle that. But more important than just psychological stressors are food allergies, lack of sleep, poor diet choices of processed foods, and environmental chemicals like bisphenol A in our plastic water bottles. Who knew that can contribute to stress on the adrenal? Same with lead or mercury or heavy metals, infections. So people who have hidden viral infections like Epstein Barr or people who have been on the East Coast and got infected with Lyme’s disease or tick-borne illnesses. And then gut infections. As I know with your audience – and I don’t know if you knew, Jennifer, that I’m Celiac as well. Jennifer: I did not know that. Dr. Jill: Yes. I have the granddaddy and we don’t need to digress on this, but the DQ2 gene. I was first diagnosed with Crohn’s until I found out I actually had Celiac disease. And so your listeners, I’m sure, can relate to that. But obviously, food and food intolerances and gut dysbiosis has a huge profound effect. And because I love functional medicine, when someone comes in and we see adrenal dysfunction, I’m saying, “Okay. Beside just psychological stressors, what else in the body is creating stress?” Things like a recent surgery could do this. We’ll probably talk about this, but excessive exercise. I’m all for exercise. but there are people who exercise enough that they create their stress in their adrenals. Caffeine and sugar can be problems. So there are many, many things that can contribute to this. Jennifer: Do you see this more in women than men? Or is it even across the board? Dr. Jill: Yes. And I think part of that is our society right now, there are so many women who are working. They’re taking care of their kids. They come home and they have full time job at the house. So there are so many demands on the women. And then in addition, women, I think their hormones, thyroid, we see a lot more autoimmunity in women. So autoimmune adrenal disease or autoimmune thyroid disease – which thyroid and adrenal are like two yoked horses that work very, very closely. If you have dysfunction with either gland, you need to address the other gland as well because they both really contribute to one another. Jennifer: So if someone has Hashimoto’s or hyperthyroidism, they should actually be also paying attention to their adrenals. Is that what you’re saying? Dr. Jill: Absolutely! And importantly than that is if they are especially newly diagnosed with thyroid dysfunction, the rule of thumb, you absolutely have to check the adrenals before you treat because again, think about these two yoked horses. One is your thyroid and one is your adrenal. Say, someone has hypothyroid or Hashimoto’s and needs medication for thyroid, if you try to beat that horse on the right, the thyroid horse, and that poor adrenal horse can’t keep up, it’s almost like the body, if it’s stimulation mode from thyroid, but the adrenals are so weak, they can’t be stimulated, people will feel a lot worse instead of better. And I would say the large percentage of people who get put on thyroid medication and feel miserable. The reason is their adrenals are so weak they cannot handle the stimulation. And they still need replacement. They still need to be treated, but they have to address the adrenal gland first before they address the thyroid. Jennifer: Wow! That’s really interesting because there are so many cases and stories out there of women who have Hashimoto’s. They’re taking all different sorts of medications. They just don’t feel better and they’re exhausted. They can’t shake that exhaustion and they can’t feel better. That’s really interesting. Dr. Jill: Think about this, Jennifer. You take an old model T car and then you try to race it around the track at 100 miles an hour, it shakes and rattles and starts to fall apart. That’s what you’re doing when you have adrenal dysfunction and you try to race it, you add in thyroid medication to stimulate metabolism, it’s like you’re racing that old car that can’t do it. And so you feel worse instead of better. Jennifer: That’s great to know. I hope that’s an a-ha for many who are listening out there, especially who are dealing with thyroid issues because it is so – I mean, one in eight women are diagnosed with a thyroid problem. It’s such a pervasive issue at least in the United States. And to know that maybe we also need to start paying attention to the adrenals as well, that might be a big a-ha for a lot of people out there, especially those listening to this. So why don’t we get into this whole issue of what can contribute to adrenal fatigue? I would like to talk for a little bit about blood sugar and how blood sugar is involved with this. And you know, as well as I and most people listening here, that the gluten free diet, the traditional standard gluten free diet is loaded with very refined starchy carbohydrates that are high glycemic, that are not good for you, that can contribute to all sorts of problems. I think, and this is why I said don’t fully blame gluten, but I also somewhat blame going gluten free the way that I did (because I ate my fair share of gluten free cookies, cupcakes, brownies, you name it), that if you are eating a diet that is loaded with refined (gluten free) carbs, that can contribute to part of the problem because it’s a lot of stress on the body. What is your take on that? Dr. Jill: Oh, such a good point. And because adrenal hormones will regulate blood sugar, this is actually a huge key. I had some questions that I will ask patients and even before I do a test, which we can talk about, I can usually determine just by questioning them some of the things that will indicate to me they have adrenal dysfunction. So usually I’ll first ask them, “When you wake up, do you feel refreshed?” Cortisol should go up in the morning and we should wake up out of bed – and yeah, you might snooze once. But after that you should feel refreshed, you wake up, you’re ready for the day within 30 minutes – and that’s without the aid of stimulants, which I love my coffee. But that cortisol should provide what you need to feel awake and alert for the day.If people feel un-refreshed after a full night sleep, that’s one sign. Another thing I’ll ask is, “Afternoon, after lunch, do you feel tired? Do you feel depleted?” or if they stay up late and they’re tired in the afternoon or evening, but then about 10, 11 o’clock, they get a second wind, and they’re wide awake until 1 a.m. That’s also some signs of dysfunction of their awake/sleep cycle. Then I’ll ask about craving. I think of crutches for the adrenal as caffeine and sugar. Patients who crave and cannot survive without their whole pot of coffee in the morning, they definitely have adrenal dysfunction because caffeine and sugar will both secrete cortisol, so you temporarily feel better. But then you’ll crash even worse afterwards. So often, these people, they need a fix of sugar in the afternoon or in the evening, they’re craving carbs. That’s adrenal dysfunction. And they feel better temporarily, but then they’ll crash. And again, that’s part of the blood sugar regulation. Another thing is, I’ll say, “Do you wake up at 2 or 3 a.m., wide awake with your mind racing with thoughts and ideas and the projects that you need to complete?” The reason that can happen is because overnight, we’re fasting. We’re not eating. And adrenals control the release of sugar from the liver while we’re fasting. If your adrenals are weak, what will happen is around 2 a.m., your blood sugar will drop unbeknownst to you, you’re sound asleep, and that drop in blood sugar will stimulate a normal physiological response, which is an elevation of cortisol. So the cortisol goes up so that you don’t have totally low blood sugar. That cortisol then will wake you wide awake out of a deep sleep. And usually, the hour that that happens is between 2 and 3 a.m. So that’s again, that blood sugar regulation. During the day, people can have symptoms of dysfunction as far as they have to eat every two or three hours or their blood sugar drops. That’s very common with adrenal weakness. They have this hypoglycemia if they don’t eat and they crave carbs, so they do this spike up and down. Jennifer: I want to ask you about carbs because you mentioned a bunch of things here about sugar. And there’s this whole low carb craze going on right now. What do you think about that in terms of adrenal issues? Dr. Jill: Because the adrenals regulate sugar balance, and if they’re very, very weak, if you have what we call adrenal fatigue or severe adrenal dysfunction, what’s going to happen if you go extremely low carb especially in the evening when you need your cortisol to go down for sleep, is you’re going to have blood sugar dysregulation. So you’re going to have spikes and drops in blood sugar, up and down. And sometimes with the extremely low carb diets, the adrenals actually take a really big hit. You feel a lot worse instead of better. For some people with adrenal dysfunction, I want them to have healthy complex carbs, not the sugar and the processed food. They actually do better. I still believe they’ll do better with protein in the morning than fat. So they need to start their day with that because that will actually raise cortisol in the morning when you should have it high. But in the evening, a lot of them, to sleep well and to maintain blood sugar, need a cup of cooked rice or quinoa or some sort of sweet potato, some sort of healthy starch. And some people who goes so low on the carbs will actually cause a worsening adrenal dysfunction. Jennifer: Let’s get to testing. What can people do to figure this whole puzzle out from a testing standpoint? Dr. Jill: So what we want to determine, as I mentioned earlier, is this curve. So what is your cortisol curve during the day? The best way to test that (and this is very well-documented in the literature) is through saliva. Typically, if I really want to know the daytime rhythm of the cortisol, I’ll have people do a 4-point cortisol test where they spit saliva into a tube and we do that first thing upon waking, then before their meals and at bed time. So we can check during the day and then we can plot this on a graph. And that should be high in the morning and low at night so they can sleep. That is probably the best known test. None of these tests are perfect. Like I said, I still often do a serum morning cortisol just as a spot check because if they’re low on that, they have very significant dysfunction. But there are many, many people, who, because of the needle, will have elevated cortisol or normal even when they are very depleted. And then you can also do urine testing for all kinds of hormones including all the adrenal metabolites, the things that the adrenal gland produces. And frequently, I’ll do this. It’s a 24-hour hormone test on women when we want to look at not just the adrenals, but their hormones and all the other things that play into that. Jennifer: And I think that there are just so many options out there. I know that I had the saliva testing done. I’ve actually had it done twice. The first time it wasn’t terribly off. It was slightly off, but not anything to be too concerned. And the second time, after all this exercising and everything, and I really was not feeling well, the curve was almost not a curve at all anymore. I just was barely hanging on. I know what it’s like to be there and know you have that – you know yourself best, let’s just put it that way. You know yourself best. When something is wrong, you need to seek out a physician that believes you and is willing to do what it takes to figure out where the imbalance is because I couldn’t tell you what exactly was wrong. I just knew something was wrong. Jennifer: As far as if you get this conclusive diagnosis, “Yes, you have adrenal fatigue,” what do you suggest? Just give us a handful here of some lifestyle and dietary changes that can really help you feel better and improve energy and decrease the symptoms that you’re having so that you start to feel better. And I would love for you to also clarify that this tends to be more of just lifestyle and dietary issues. I know for myself I had to take DHEA and some other supplements as well. But you should work with a practitioner anytime you “tinker” with your hormones. It’s not a good idea to do that on your own. It is a very complex system. So could you just go over some of that and I guess emphasize my little point there because I don’t want to see people just running out and buying hormones and doing this themselves. I think that’s pretty much a recipe for disaster. Dr. Jill: Yes, Jennifer. And so, find a functional medicine-trained doctor in your area. And there are many. You can go to FunctionalMedicine.org which is a big training institute and search by zip code. So find someone to help you. There’s great nutritionist. They don’t have to be an MD. They can help as well. I mean, all kinds of practitioners of various degrees know about this and understand it and can treat you. Find the help. Get the testing because you don’t want to guess. You don’t want to guess. And what happens is there are some people we talked about at the ends of the spectrum that have high cortisol and not low. And if they take in a supplement like you did for low cortisol, they are going to make their system a lot more imbalanced. So it’s really important to know are you high, are you low? Where are the highs? Where are the lows? Every person is treated individually. And note, there’s no one herb or one supplement that fits. But practical things. You mentioned just taking some quiet time every day – prayer, meditation, yoga, stretching. That’s huge. We know that from the Heart Math Institute thoughts of love and gratitude actually stimulate this calming parasympathetic system. As simple as that sound, five minutes thinking about someone you love or your puppy who you love has actually profound effect on the HPA access. Sleep. Sleep is huge. And so many of us are trying to get by with six hours because we’re burning candles at both ends of the spectrum and this is critical. The very, very first thing I do with patients is make sure they’re having good sleep, they’re waking up refreshed and they’re getting seven to eight hours every single night. For me, that’s one of the non-negotiables in my life. I go to bed at 9 or 9:30. I get up early at 5. But I always get my eight hours in. It’s non-negotiable. I think that’s one of the reasons my adrenals have held up pretty well. So sleep. Then stressors. And stressors, of course, we talked about sometimes you can’t eliminate them, but how you perceive them may be able to be eliminated or changed. More important than that is you have to think beyond just psychological stressors and make sure your physician is testing you for hidden infections or gut imbalances or inflammation because all of these things on the body can play a role. And then just chemicals in our environment and our food, getting rid of processed foods and things that have lots of damaging chemicals, drinking out of aluminum or stainless steel or glass water bottles instead of plastic. Coffee and sugar, we mentioned our stimulants and those temporarily take you up, but then they crash. So for a severe adrenal fatigue patient, I would usually take them off caffeinated beverages and eliminate sugar in its refined form at least temporarily. It’s funny things like the news and TV, computers, iPads at night, that’s very, very stimulating to the body. The eyes actually see that light as a stimulus and so for sure, before bed, an hour before bed, you should get off your computer, off your iPad. If you’re going to read, read a real book and not your iPad because your eyes are very sensitive to that light and it’s a stressor. And then we talked about exercise. So you don’t want to stop moving. You want to still stretch and walk and maybe do some weight training. But you want to make it in moderation. And if you ever feel worse or you’ve crashed the day following, that’s too much. You got to slow down and pull back on that exercise. And typically, the cardio type of stuff is actually the worse thing. If you’re doing an intense cardio regimen, that’s the kind of stuff you want to pull back on or eliminate all together. Again, walking is very, very therapeutic. You could walk for an hour. But if it’s a gentle, nice pace, that’s great for the adrenals and not a stress. And you can definitely do stretching, yoga, Tai Chi, any of those things where you incorporate breathing because breathing actually changes the stress response. So anytime you’re meditating, breathing, exercising with breath work, that’s very, very profound. I love it. I love hearing that kind of stuff and I really appreciate everything that you’ve shared because this is a ton of information. I think that any person that listens to this – I mean, I even learned a few things today, which is great. I love to learn and I’m so glad that you allowed us to pick your brain and tell us all of this information. And is there anything special that they could – if someone wanted to reach out to you, are you taking patients? Dr. Jill: I am. I do have a long waiting list, but if they’re willing to wait just a bit, I do my best to get to as many people as possible. And I love seeing new patients. But definitely, stay in touch by the newsletter because that way you can – here, I write articles like adrenal fatigue type stuff and try to just share that information for patients. Jennifer: Thank you so much for being here. I really appreciate it. Dr. Jill: Thank you, Jennifer. I’ve had a blast! Jennifer: I hope you can come back sometime! 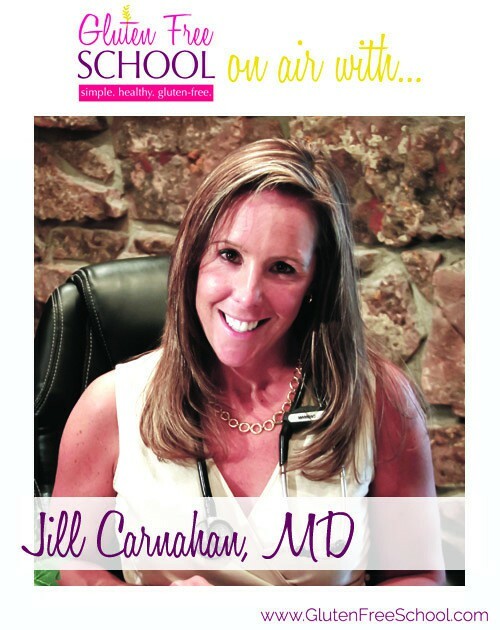 So, again, if you have not gone to check out Dr. Jill’s website, go to JillCarnahan.com. This topic is so important to me and it’s one that really did change my life. I’m glad that I had the experience because I wouldn’t be doing what I was doing with Gluten Free School if it weren’t for the whole thing of adrenal fatigue that I experienced back in 2009. It was a big eye opener for me. I hope that this conversation today gives you some clues or pieces to the puzzle that you are maybe sorting through in your own life. Thank you so much for joining me and I look forward to seeing you the next time. Bye. Jennifer Fugo, MS, CNS is an integrative Clinical Nutritionist and the founder of Gluten Free School. She works with women who are fed up with chronic gut and skin rash issues discover the root causes and create a plan to get them back to a fuller, richer life. Thank you Jennifer, great interview and information from yourself and Dr. Jill! I have run into the same frustrations with conventional doctors dismissing adrenal fatigue even though my symptoms clearly point there. I have signed up for your special webinar and look forward to learning more on the road to feeling better. Just listened to you piece re adrenal fatigue. I have known for years that I have this, but western medicine routinely is fragmented, and few in this profession follow the whole thread . I am a classic case( wake up fatigued, wake up at 2-3 am etc). I follow a gluten free diet, and take Ashwaghanda supplement, as well as meditate regularly. I will check out the page for functional medicine MDs.